It's like people you see sometimes, and you can't imagine what it would be like to be that person, whether it's somebody in a wheelchair or somebody who can't talk. Only, I know that I'm that person to other people, maybe to every single person in that whole auditorium. August Pullman is ten years old but has never gone to school. It has always been easier for August to be taught at home. There were surgeries to be considered and doctors appointments. You see August has a facial deformity and it shapes his life. 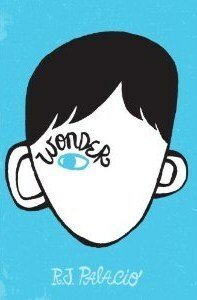 Wonder is the story of August's first year in school, his fifth grade year. August enrolls at Beecher Prep Middle School where the academics are easy for him, but his severe facial deformity makes it difficult for him to trust the motives of his peers. It is hard for August to make friends. Some incredible people are in August's life - his mom, dad and older sister cherish and protect him. But a boy needs more. He needs friends. Two kids at Beecher Prep are able to see the boy instead of the face, and their friendship opens a door for August. He learns he is more than a face and that others can see that too. 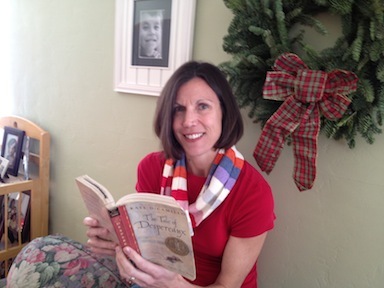 R.J. Palacio is the author of Wonder. It is her first novel, and she so got it right. August is believable, written as a fifth grade boy like any other except he constantly deals with the stares of strangers and the bullying and insensitivities of some of his peers. He's not perfect. He can be harsh and selfish, but the August that you take away from this book is charming, smart, honest and funny. The story is primarily told from August's perspective, but other characters jump in and tell their story as it relates to August. Again, Palacio pulls off a literary challenge - changing narrators without losing the character. August is a wonder. You'll cry for him, cheer for him, and you'll wish you knew him. He's that special. But hey, if they want to give me a medal for being me, that's okay. I'll take it. I didn't destroy a Death Star or anything like that, but I did just get through the fifth grade. And that's not easy, even if you're not me. What a WONDERful book. I have to run to the store and buy more Kleenex because I went through the box and a half that I had on hand. Auggie is such a brave kid that has already faced a lot of adversity in his short life but he does it well. He is a smart, funny and kind kid. This was a great read! I agree...such a wonderful book! What a great book. I am looking forward to reading more of the winners.